Techniques including satin stitch work and couching techniques, cut work, scallop hem and corded scallops, using twin needle for embroidery, practical work and pintucks with and without cord. Work in a hoop and experiment with straight stitch, zigzag and patterns for sewing monograms, cut work and embroidery. Use water-dissolving fabric and learn how to adjust the top and bottom tension when using difficult threads and whip stitching. Advanced techniques are worked or shown on request, couching, appliqué, drawn-thread work and cord on a bobbin. City & Guilds Embroidery in a nutshell. Work with a selection of materials, tulle and threads and experiment with all types of machine decorative work using the presser feet and free machine sewing with and without a hoop. Use straight stitch, zigzags, patterns and a variety of techniques to create unique, quick and effective embroidered textile work. Learn the art of surface painting with threads using your sewing machine to create simple but beautiful landscape pictures regardless of your artistic ability. Simple step by step instructions resulting in a framed picture that can often be mistaken for an impressive photographs. Learn how to do Satin Stitch Appliqué on woven and stretch fabrics and quilted appliqué work. Achieve a neater finish and an even stitch, neat and easy corner turning and using embroidery effects. An easy technique of working perfect appliqué every time. Come and learn a fascinating method to reproducing stained glass window. This technique is often known to be very frustrating but with our method and help you will produce remarkable results for quilts, patchwork, gifts, pictures and cushions. This course is designed to show you how to embellish summer t-shirts and all types of knit-wear to create individual fashion clothing for your holidays, designer items or to meet those special friends! Includes chenille appliqué, couching and corded techniques, also free-motion Vermicelli, appliqué and embroidery. Go home with a new designer item and inspiration to recycle your whole wardrobe! Learn how to do Satin Stitch Appliqué, Loose Leaf, Madeira Appliqué (turned edge) and multi-coloured appliqué on woven fabrics. All the hints and tips you need to achieve a neater finish using different Patterns and Machine Stitch techniques for all aspects of appliqué work. Sew perfectly straight very fine tucks and pintucks, attaching edge and lace edging. Insertion lace, fine edge mitered corners with and without lace, extra fine rouleau loops, faggotting, hemstitching techniques using Wing Needle, Shell/Scallop edge and picot edge, gathering easily and quickly, piping and other practical and decorative applications. Create soft, warm and luxurious chenille material from a wide variety of woven fabrics; learn tips, tricks and techniques to achieve a great result every time including chenille appliqué. Ruth will also explain how to make your own Chenille-by-the-Inch to quickly embellish a small or large project and take it to a new dimension. 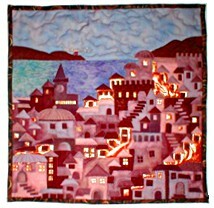 Using the fantasy embroidery methods and small pieces of 7 or 8 fabrics very simply cut to create a base then build a unique seaside village collage and embroider simply and easily to achieve a masterpiece that will impress and inspire even the least creative student. A course that can be developed into creating cushions, bags, panels or stunning wall hangings.